Oil has always been beneficial for life or I can say for skin-health. It has always been used for thousand years in medical or health purposes. Bio-Oil is the oil that i have been using since i was in junior high school. As soon as i got invited, you know that feeling right, felt really excited! Product introduction from Ibu Nurhayatini, Product Manager of Bio-Oil. Met her twice before this event, she is really good in person and really great in explaining the Bio-Oil benefits. Not like any other, this oil is really multi-function, made from great ingredients to answers your skin problem. The dermatologist of the day, He explained to us the difference between healthy and unhealthy skin. The thing is unhealthy skin is all about damage skin, far from soft textured, not hydrated enough and so on. And skin type is based on congenital factor but skin condition is what you can mantain by consuming healthy food, drink enough water to make it stay hydrated, exercising and using skin care such as Bio-Oil to protect your skin from damage. Now it has new version of packaging design. I love it more because it becomes more minimalistic and not only that, it also varies into 4 different sizes such as 200 ml, 125ml, 60ml and the most handy one 25ml. So happy that I got the 25ml because I find it really fits in my hangout mini bag. But if you fancy the big one, you can definitely choose the 200 ml. Is the most widely used antioxidant in skin care products today, vitamin E helps maintaining the skin to look healthy. Vitamin E also makes skin soft, smooth and supple. Calendula oil can be used to care for sensitive, broken or burned sunlight skin. Lavender oil has been known as the properties of showing skin, giving exciting benefits. It refreshes the skin and gives soothing sensation. It soothes the skin and really beneficial for sensitive skin. Reduces the control of formulation, increasing the application ability on skin. It makes the oil absorbs quickly into the skin. Worry not, Bio-Oil is clinically tested and safe for long term use even for pregnant woman. Popularly known to fade scars, it fades the scar out, uneven skin tone, prevet skin from aging and lastly to moisturize dry skin. Before application, it's transparent and has no stingy scent, just fine. Absorbs thoroughly into the skin and super quick! Rub it in circular motion to get the maximal result. And you know what, this is the oil that i have been using since junior high school !! I personally use it to fade scar caused by my curler and it works! Nothing's instant, so you better have patience and keep yourself commit to use the bio-oil regularly. It could fade any scar, stretch mark within 3 months of application. 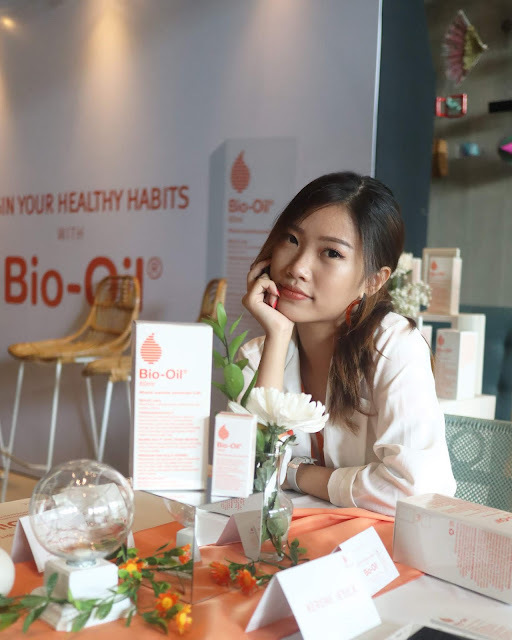 If you want to try out this Bio-Oil, it surely can be purchased at nearest drugstore such as Natural Farm, Guardian, Watsons, etc. Can't wait to hear the positive feedback of my fav product, see you on another great product's review!